Get a fun novelty street sign for your home and office and show off your sense of humor.Looking for a fun, hilarious street sign to hang on your cubicle or in your “man cave”? If so, SignMission has all the cute, funny, hilarious, and even work-related novelty signs you’re looking for!Something for EveryoneWe’ve got a wide range of American-made signs just like this sign that will tickle your funny bone, make others smile, or even show off your snarky attitude.Made To LastMade from a special plastic desgined to hold up to a beating, This sign can bend with out breaking and will never chip or crack, the colorful lettering will last a lifetime indoors and up to 4 years in the sun for outdoor use.Product Details:Pre-Drilled Mounting HolesIndoor and Outdoor UseRust and Fade ResistantOne-SidedDimension: 4” x 18”Made in the USAOutdoor Durable Plastic and Premium-Grade InkClick ‘Add to Cart’ to get your Woof Street sign today and enjoy a good laugh each time you pass by! Get a fun novelty street sign for your home and office and show off your sense of humor.Looking for a fun, hilarious street sign to hang on your cubicle or in your “man cave”? If so, SignMission has all the cute, funny, hilarious, and even work-related novelty signs you’re looking for!Something for EveryoneWe’ve got a wide range of American-made signs just like this sign that will tickle your funny bone, make others smile, or even show off your snarky attitude.Made To LastMade from a special plastic desgined to hold up to a beating, This sign can bend with out breaking and will never chip or crack, the colorful lettering will last a lifetime indoors and up to 4 years in the sun for outdoor use.Product Details:Pre-Drilled Mounting HolesIndoor and Outdoor UseRust and Fade ResistantOne-SidedDimension: 4” x 18”Made in the USAOutdoor Durable Plastic and Premium-Grade InkClick ‘Add to Cart’ to get your Blue Healer Street sign today and enjoy a good laugh each time you pass by! This sign measures 6" x 16" Hand-made in America, these sturdy metal signs will perfectly accent any kitchen, home, bar, pub, bath, office, garage, or business. Each sign is created by baking enamelized ink into a tough, polyester coating on a thick steel blank. The result is amazing durability,rich color, and fine detail. Add a stunning and colorful touch to your home with these versatile and affordable wall accents. These are not like those thin, cheap tins other companies make. When you hold this sign in your hand you will definitely feel and see the Home Body Accents difference. 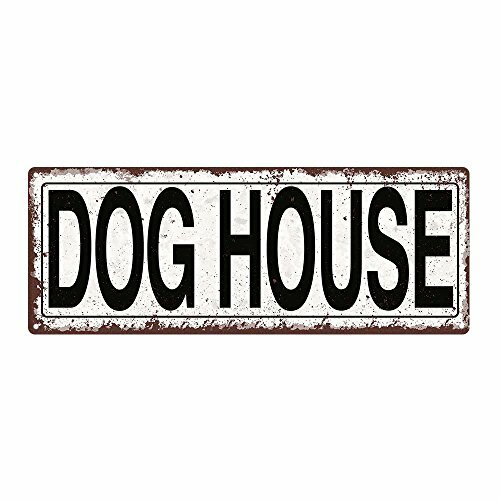 VinMea Dog House Novelty Metal Street Sign Quality Aluminum Metal Sign 3"x18"
Our novelty signs are made from outdoor durable plastic. These signs will never rust or fade, perfect inside or out (4-5 years outdoors)! The sign has round corners and a hole pre-drilled for easy mounting. Please check out all our other signs, they make the perfect gift for any occasion. 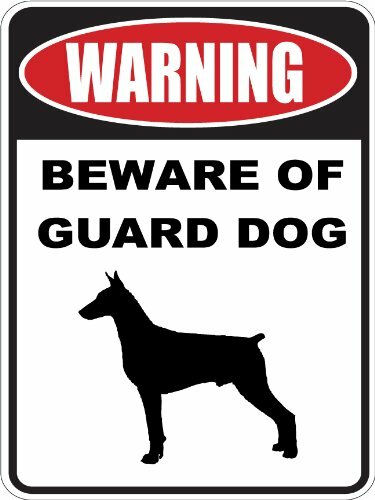 10"X14" WARNING BEWARE OF GUARD DOG DOBERMAN PINSCHER dog lover aluminum novelty street sign. This is a aluminum sign with applied graphics that will withstand the elements. Great room decoration and gift idea for the hard to shop for person. No Holes can be hung with double sided tape or holes can be easily drilled. Get a fun novelty street sign for your home and office and show off your sense of humor.Looking for a fun, hilarious street sign to hang on your cubicle or in your “man cave”? If so, SignMission has all the cute, funny, hilarious, and even work-related novelty signs you’re looking for!Something for EveryoneWe’ve got a wide range of American-made signs just like this sign that will tickle your funny bone, make others smile, or even show off your snarky attitude.Made To LastMade from a special plastic desgined to hold up to a beating, This sign can bend with out breaking and will never chip or crack, the colorful lettering will last a lifetime indoors and up to 4 years in the sun for outdoor use.Product Details:Pre-Drilled Mounting HolesIndoor and Outdoor UseRust and Fade ResistantOne-SidedDimension: 4” x 18”Made in the USAOutdoor Durable Plastic and Premium-Grade InkClick ‘Add to Cart’ to get your Labradoodle Street sign today and enjoy a good laugh each time you pass by! Compare prices on Dog Street Sign at LiveSaler.com – use promo codes and coupons for best offers and deals. We work hard to get you amazing deals and collect all avail hot offers online and represent it in one place for the customers. Now our visitors can leverage benefits of big brands and heavy discounts available for that day and for famous brands. We try to makes comparison shopping easy with Product Reviews, Merchant Ratings, Deal Alerts & Coupons. Find Deals, Compare Prices, Read Reviews & Save Money.